DETROIT, Mich.–The Army unveiled new automated vehicle (AV) technology this week that could be deployed before self-driving cars hit city streets in big numbers. At the same time, much testing is going on with commercial vehicles that could result in delivery trucks being approved for Level 5 autonomous driving before personal vehicles. The military is very keen to exploit autonomous vehicle technology as a way of saving lives on the battlefield. More than half of all battlefield casualties happen when soldiers are delivering fuel, food or other supplies in combat zones. Autonomous vehicles could save hundreds of soldiers’ lives per year. 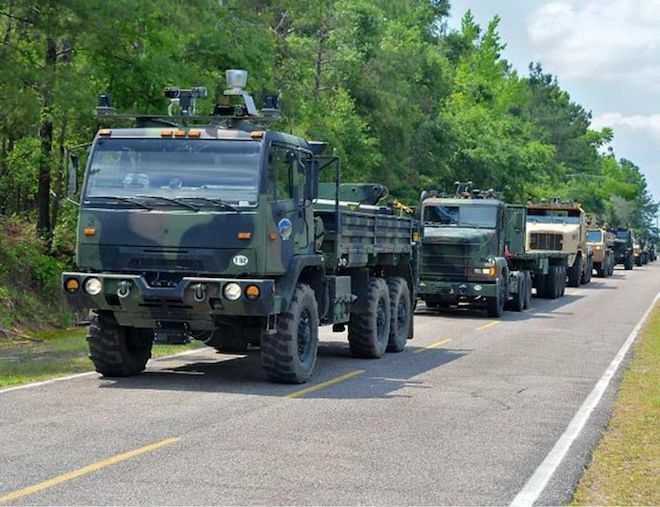 The military model for autonomous vehicles would be to have a pair of drivers in the first truck of a convoy, followed closely by a line of unmanned trucks. Seventy AV trucks will be deployed at Fort Bliss texas and two other U.S. military bases over the next year, giving soldiers an opportunity to work with them and develop tactics and procedures they can transfer to the battlefield. The original plan was to put 300 autonomous trucks into service in 2025. To bring the program forward, the Army pared down its original list of 45 requirements for AVs to 15 “must-haves,” Trucks.com reported. The plan now is for production to ramp up starting in 2021, per National Defense magazine. Oshkosh Defense received a $49 million contract in June 2018 to outfit its trucks with autonomy kits. Lockheed Martin is the systems integrator. Autonomous trucks are seen as a way for trucking firms to solve the problem of cutting costs and scrambling to retain drivers. Pay for drivers is not very attractive, not are the arduous working conditions. But more states are letting companies test autonomous trucks. California is home to some of the biggest players in autonomous driving, including Tesla and Waymo. The companies have long tested self-driving vehicles in Arizona and Pennsylvania where testing is allowed. In 2018, the California Department of Motor Vehicles issued its first permit for testing self-driving cars on public roads to Waymo. It’s about to open up the process to certain classes of vehicle. Companies can test autonomous delivery vehicles weighing less than 10,001 pounds with an approved permit from the DMV, according to the DMV’s proposed regs. That qualifies Class 1 and Class 2 vehicles—minivans, pickup trucks, utility vans, and step vans will all be allowed onto the road. We have seen projections of autonomous driving acceptance over-stated before. But some analysts are predicting that by 2025, 85 percent of last-mile deliveries could be made with semi or completely autonomous vehicles.